Sponsoring a Cocker Spaniel is so easy. Maybe you’re not living in a location where you can have a pet of your own, or maybe your busy schedule means having a pet is not in the cards. When you choose to sponsor one of our incredible Cockers you will be part of his/her life, but CSR takes care of all the day to day nurturing and needs with the generous help of your financial support. 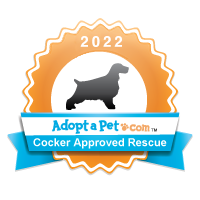 When you choose to sponsor a Cocker at CSR, we send you a Certificate of Caring. The certificate has a picture of the dog you will be supporting and a message on how your generosity is helping the Cocker. We rely on kind-hearted people like you who want to give by either one-time sponsorship gifts or on-going for several months or years at a time. – $100.00 pays for a heartworm positive treatment for a dog. Please contact us with any questions you have about sponsoring one of our Cockers and we’ll work with you to find the opportunity that fits best for you.